I was NOT feeling the Halloween spirit this year. Call me a witch. Or a word that rhymes with witch. I don’t care. A big part of it had to do with work-place festivities. See, I’m in the midst of moving from a lovely, darling, mostly private office in McHenry, to our paper’s main office in Crystal Lake. The main office is filled with people and germs and noise. To me, at least at first, this was the equivalent of switching from a lovely moisturizing, 7-blade, heated, vibrating, purple razor to a rusty nail pulled from a hobo’s back pocket for my shaving needs. It’s no secret that in McHenry, I was spoiled. I had a luxurious, quiet, writing environment where I could easily slip into “the zone.” The magical place where story ledes flow through my fingertips and words align like stars. Not so much in Crystal Lake. More like the opposite. And Friday was probably the worst day to jump in. I had never been in the main office for a holiday. Or even a party. And there was CRAPTONS of Halloween stuff going on. People were dressed in costumes, and blaring haunted music and eating more calories in a hour that I usually eat in a week – all while I was on DEADLINE! It’s kinda hard to find “the zone” when there’s rows and rows of hanging bats above the department next door and kids keep walking past looking for candy. And when I went to work Saturday, I was kinda hoping it had all been a bad dream. It wasn’t. There were still bats. During my brief free time I started looking for a cartoon I could put on my work monitor to make me feel better. I finally found one that said “Evil plans are best.” But I was unclear about how this whole, “working near bosses” thing worked and wanted to check with some co-workers to be sure that none of the higher-ups would interpret that to mean I was crazy and had an actual evil plan to like, hack our system (I don’t) or bring down the paper (Again. I don’t). And someone chimed in that it’s unlikely that in the spectrum of employees I would fall anywhere near the “crazy” side. 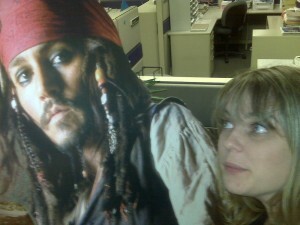 And that I’d probably have to bring in a life-size cutout of Johnny Depp (whom I love) for people to think that. A LIFE-SIZE CUTOUT OF MY SOUL MATE WAS MERE DESKS AWAY!!? I went to take a picture. (See below). My co-worker than said it’d be “crazy” if I brought in a big bag of money. And just like that, the “crazy-makes things so” magic was dead. But alas, knowing that at least one person in this strange new office loves Johnny Depp enough to buy a life-size cut out makes me thing this whole transition might not be that bad. And now, without further ado – the photos. 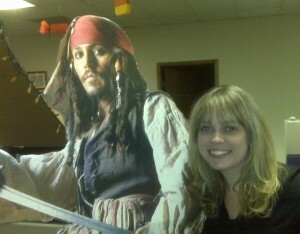 Feel free to pretend it’s the REAL Johnny Depp. I do. And tune in next week to read about my evil plan to steel steal him. (editor’s note: Such a plan may or may not exist). Photo by the supa amazing Val! the other week i was walking through the halls of a high school and i saw this thing out of the corner of my eye. and suddenly the world started moving in slow motion. but yes. yes it was. 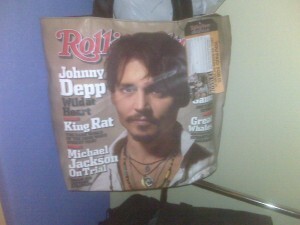 it was a PICTURE OF JOHNNY DEPP ON A HANDBAG! i started mugging the woman wearing the bag. i stopped to politely tell the girl wearing the bag that i thought it looked nice and then i asked her where she got it. she got it a wal-mart. about 38 seconds (ish) later i went to wal-mart. alas, they were sold out. but then, this weekend i made my way to a wal-mart in the middle of nowhere land. actually, if you go to nowhere land, and then go west for 45 minutes, that’s where i was. some people call it geneseo. and i strolled over into the purse section just to see, and there it was. you’re asking me if i bought it? really? you have to ask that? because OF COURSE I FREAKING BOUGHT IT! isn’t that the greatest thing you ever saw in your whole freaking life? now i just have to decide if i should wear it to work or if that would make me seem, umm crazy. my thought is that the other side is plain black, so when i walk past my bosses’ desk, i’ll just face that out toward them. OMG! Public Enemies was so COOL!! i did in fact go to the mid-night (12:01) showing last night and i had six of my family members in tow (mom, sister, my sister’s neice, two cousins and a brother). and, ok. the movie was a little confusing, and i wouldn’t have been opposed to say, johnny depp maybe wearing a bright red shirt for the whole movie and christian bale wearing say, a bright blue shirt, so i could make sure they were in in fact not the other guys who just go shot who looked JUST like depp or bale and were wearing the same exact outfit and hat. but, you know, other than that, i have no complaints. for crist’s sake JOHNNY DEPP WAS IN EVERY SCENE! ok. not every scene. but seriously 9 out of 10 scenes had his wonderful, wonderful face in it. granted, this blog post probably has more words in it than all the dialogue in that movie. but HOLY COW THE ACTION! there with was SO. MUCH. ACTION! and if i go with you, i can totally do the same. and YES, i will go with you. i will go see this movie three million times. ish. and then i will buy the dvd. and then i will buy the dvd with bonus features. well, since I'm officially "the closest to a real stalker as (my co-workers) can allow (me) to ethically get" . So i think people totally underestimate my stalking abilities.